Most new bloggers started out using WordPress.com, Blogger, or some other basic platform as they can start blogging without any expense. These platforms works perfectly well as they are targeting friends and family for their new mommy blog (or whatever they happen to be writing about), Unfortunately these new bloggers are leaving a lot on the table if they don’t think about Search Engine Optimization (SEO), and they could be opening up their blog to all kinds of new readers if they just paid attention to a few items that would help get their content ranked. This guide is focused on the WordPress.com platform. If you are a new blogger and are interested in getting your content ranked, by all means keep reading. Don’t listen to the experts that say you need to be on the self-hosted platform of WordPress if you are serious about blogging. You can definitely get your content to show up on the first page of Google using my WordPress.com SEO guide. Trust me, I did it with my personal blog when I was first starting out, and had great success ranking on the first page of Google with a few of my choice key words. A little about this WordPress.com SEO Guide. This is geared towards the new blogger, so I won’t be getting all technical on you. I’ll keep this SEO guide simple, and give you just enough to help you understand what some of the secrets are to getting your content to rank. What is SEO? SEO is short of Search Engine Optimization. As the name implies, it’s the practice of optimizing your content for the search engines. When you do a search in Google, I’m willing to bet that you click on one of the first 3 results that are displayed roughly 80% of the time. Think about that next time you do a search. How does Google determine what order the content is displayed in their results page? Google has an entire algorithm that is constantly being tweaked to determine how they show results in their search pages. The details of this algorithm are mostly secret, however there are a few well known items to focus on, which is where we will begin. Believe it or not, the WordPress.com Theme you use for you blog design has a lot to do with how your blog will rank in the search engines. So logic would dictate that we start with this. However, you first need to understand a little bit about what Google looks for in your blog, and how it uses that to determine where it places your content in the search engine results page (SERP). Given that, know there are 100’s of free Theme’s to choose from in WordPress.com, and not all of them are created equal when it comes to SEO. You’ll want to be sure you use a Theme that will help your WordPress.com SEO, not hurt it. So what theme should you use? That’s really a personal preference, as every site or blog has their own design requirements. Every one of the standard WordPress Themes (Twenty Eleven through Twenty Fourteen) are designed around SEO, and you can easily customize the look of those theme’s. That’s a pretty good place for you to start. You can change your theme quite easily via the admin panel of WordPress, so just because you are starting with the standard WordPress Theme, doesn’t mean you are stuck with it. The attributes that I’m about to lay out in this WordPress.com SEO Guide are the key things you should understand and focus on if you want your content to rank. So let’s take a look at what it takes to get WordPress.com SEO ready. First things first, know your niche and name your blog appropriately. If you planning on creating a mommy type blog that focuses on cooking, crafts, and so on, make sure the name of your blog reflects the style of writing you’ll plan on doing. Instead of naming your blog something like “Jill’s Blog”, why not call it “Recipes By Jill”. When it comes to WordPress.com SEO, it’s all about the keywords you are targeting. What’s a keyword? A keyword is simply the search term you are trying to target. Lets say you are writing a post to share this great recipe you have on Chocolate Cake. Ask yourself what would someone enter into Google to find a chocolate cake recipe. Chances are they would enter something like “chocolate cake recipe”, or “homemade chocolate cake recipe”. Keep in mind the more descriptive you get with your keyword, the less competition you’ll have with other blogs or websites, and the better chance you’ll have in ranking higher in the Google SERP’s. When you have an idea for a post, try to identify the keyword you are targeting for that post. The first thing you do when creating a blog post is come up with the heading or title for that post. That’s the first box you see in the WordPress interface when creating new post content. You’ll want to include the keyword you identified for your post in that Title box. WordPress also uses this heading as the Title Tag for your blog. The title is probably one of the most important pieces of Google’s algorithm related to WordPress.com SEO. What’s the Title you ask? Well that’s what shows up in the Google Search results page (SERP), as well as what’s displayed in the tab on your browser for the page you are viewing. You want your keyword to be used in both the heading and title, and with WordPress.com that’s automatically done for you as long as you include the keyword in the heading. For the title tag, ideally your keyword is placed at the beginning of the string to give it optimum recognition. So when creating the heading for your post, be sure the keyword is placed at the beginning of that heading. Side Note: When using WordPress.com as your blogging platform, you’re stuck with having your heading and title being the same. When using a WordPress self-hosted install, you have the flexibility, via Plugin’s, to make your heading and title two different strings. A slug is simply a name given to the URL string of your blog, and is very important when it comes to WordPress.com SEO. The Post Slug is the URL string that uniquely identifies your post. Using this post as an example, the post slug is: “wordpress-com-seo-guide”. They keyword I’m targeting for this post is “wordpress.com seo guide”, and you’ll notice I’ve separated each of those words by a dash (-) in my post slug. WordPress will default your post slug based upon what you’ve entered in your heading, however you have the ability to update this to whatever you want. Again, your keyword should be a part of the post slug, with words separated by a dash. Keep the post slug to 3 or 4 words max, You can update this field directly beneath the Post Title field. If you want the search engines to recognize your keyword, logic would dictate you need to use that keyword in your content. Use the keyword you identified throughout the content of your post, in a logical manner that sounds natural to the reader. Do not use your keyword over and over, thinking the more you use it, the better chance you’ll have of getting ranked. In fact, if you use it too much, Google will penalize you which will in turn hurt your ranking. How much is too much? Good question, that’s one of the many secrets of Google’s search algorithm. There are many experts that state your keyword density, or how much your keyword is used in comparison to the total words in a post should be somewhere between 1% and 2%. While that may not seem like a lot, you’ll be surprised at how many times you need to creatively use your keyword to get to that magical number. How do you know what your keyword density is? You’ll have to use a tool to help you identify this. There are a number of free tools available that will help you understand the keyword density of your content before or after you publish your post. You simply enter the URL of your post (or paste your content), and these tools will crawl your content and supply you with the keyword density. Do a search on “keyword density tool” and pick one of the many tools that are displayed. A favorite tool of mine can be found at SEOBook. While not a key characteristic of WordPress.com SEO, having your keyword in a heading can help. A quick word about heading tags. A heading tag is a way in HTML to create headings for your content, very similar to adding headings to an MS Word document. You have 6 different heading options to choose from as you are writing your post. In the previous section on Post Title/Heading, we talked about setting the Title or Heading of your post. If the WordPress Theme you are using is SEO friendly, this Post Title will become the Header 1 for your post. You only want one Header 1 in your post, as this is what Google gives priority to for SEO purposes. A good theme will normally use a Header 2 for the Blog Name and/or Tagline that we previously talked about. That leaves you 4 different header options to choose for your content (Header 3 – Header 6). I typically use a Header 3 for my main topics (try to use your keyword here), and use a Header 4 for subsections within those topics. Search engines love websites whose content is constantly changing. The theory goes, if you are updating your content frequently, it must be newsworthy. You’re thinking I’m writing a blog, I don’t plan on changing a post that much once I publish it. While that may be the case, there’s a few things you can do so it appears that your content is being updated on a frequent basis. If you look over in my right sidebar, you’ll see a widget that I have installed of my recent posts. Anytime I create a new post, that entry will now show at the top of the widget, and the last entry will roll off. Think about it. That widget shows up on every blog article I’ve published. When I create a new post, the widget is updated, and every single post is updated as well. To the search engines, it appears that every blog post was just updated. There are other widgets you can add that will do the same thing, and they are all available in your WordPress admin panel under Appearance. Everything we’ve talked about in this WordPress.com SEO guide so far is considered on-site SEO, meaning your rank in the search engines is determined by the content on your site. One other key factor in SEO is your off-site strategy, or simply the links back to your site. Another site that links back to any content to your site, is a vote of confidence in your site. The more respectable the link, the more power the vote has. This is a whole topic in itself, but suffice to say it can’t hurt trying to get your blog some links that point to it. While you can rank well for keywords that don’t have a ton of competition without any links, a solid backlink strategy will help you rank for those competitive keywords. SEO doesn’t need to be confusing, in fact if you focus on writing good content that is geared towards humans and not search engines, that’s half the battle. 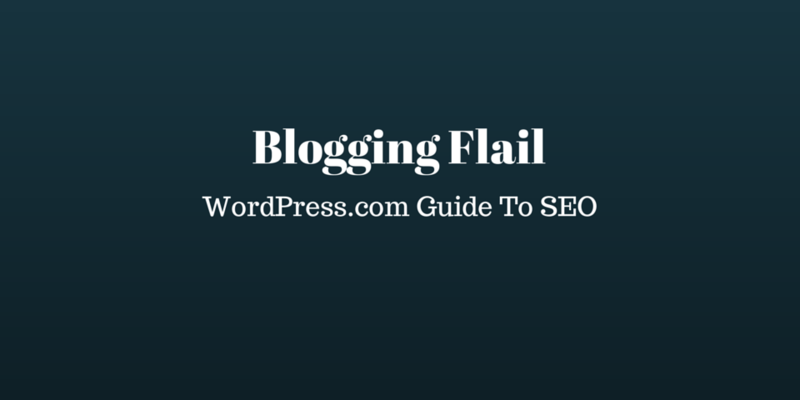 The facts I’ve laid out in this WordPress.com SEO Guide are the basics to get you started. I could dive into further detail on each of these topics, and there are a host of other items that we didn’t even touch on, but that isn’t really necessary to get you started. Bookmark this guide, and reference it as you are setting up your blog or writing new content. Once you’ve done it a few times, it will become second nature. If something isn’t working, take the time to revise your post for further SEO benefit. Feel free to ask questions in the comment section below. I check this blog frequently, and will be happy to answer any questions you may have. Best of luck, and happy blogging. [ Smiles ] Also, WordPress themes are SEO-Friendly. You’re right about WordPress Themes being SEO friendly Renard. Great point. They seem to be one of the better free theme’s when it comes to SEO. Thanks for stopping by again to comment. You made seo of wordpress.com easy by sharing this useful and practical guide. Thanks Avnish, glad you found it helpful! Thanks so much for this post. Gave me a good insight. I am about to start a blog for my website (which primarily deals with laptop recycling and selling). I have one or two questions 1) At the moment, my blog is hosten on this url https://kwam-it.com//public/blog…I am aware that the ideal URL should be https://kwam-it.com/blog ; for some technical difficulty, I am unable to achieve the latter, do you think the first option will still suffcie for SEO purposes? 2) I have alot if ideas with respect to blog contents and I think I will be able to create alot of stuff that will be very useful for my readers, my other question is how do I set up the page. should I have a lot of links going to my site from it, do I theme it just like my main site or do I treat it as a seperate page which is part of my existing business website. Hey Olly, thanks for the comment. Probably no issue with your blog being hosted within a subdirectory (actually a second subdirectory) like you currently have it. If you do decide to move it under one subdirectory, be sure you use a 301 redirect to point from your current location to the new location. I’ll be honest, I’m not really understanding your second question. Sounds like you have a main site, with a blog built in your subdirectory. You definitely want to have links between the two linking the relevant information. What you may find is that the information on your blog is easier to rank for SEO purposes, which will give you a good opportunity to link back to your main non-blog site.